This is a neato picture! 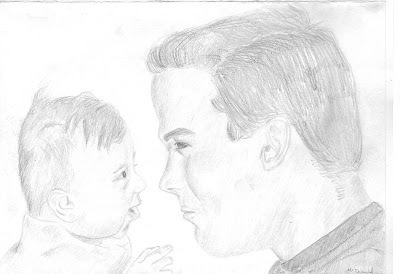 My cousin Josh that is serving his mission in Brazil (A very awesome place to serve a mission) drew this of Himself and Mayley from a picture that was taken when mayley was about 6 months old. We went to see them in Vegas when mayley was about 6 months and we must've taken this pic of them together and he has it with him now. He loves to draw. I was so happy to see that he did one of mayley! He is such a fun cousin. :) Mayley had quite the hair! Way cool pic, your cousin's talented!